From weather adjustments, to game plan adjustments to quarterback adjustments…it was a brilliantly coached game by Sean McDermott and his coaching staff. But all anyone wants to talk about and obsess about is McDermott’s punt call in overtime. That’s too bad, because it’s taken the focus off what it should be: an exciting Bills win in one of the most memorable games in team history. First, the punt call. I hated it like everyone else did. 4th & 1. Ball at the Colts 41. I get what McDermott was trying to do. He wanted to pin the Colts deep, hope for a three-and-out, and set his offense up with a short field for the game winning field goal. It didn’t quite work out. Indy got a first down, drove to their 31, and got a decent punt to put the Bills at the 35. It was a typical, conservative coach’s call that I hate. Too much thinking. Just go for it on 4th & 1, get it and win the game there. I want a coach who goes on his gut, and doesn’t over-think everything. I’m a bit worried that McDermott is too much of a thinker. Joe Webb, Deonte Thompson and LeSean McCoy bailed out their coach, the bottom line is, the Bills won. But can we all relax with our reactions to this? Really, a coach should be fired for a punt call? Come on. Stop it. We’re all armchair or Madden controller quarterbacks, and we all think that every coach should go for it on 4th and short every time, every place. I get it. But can we not turn this one bad decision to punt, into the worst decision in Bills history, as some seem to think? Bottom line, the Bills won. Isn’t that was we’re all here for. 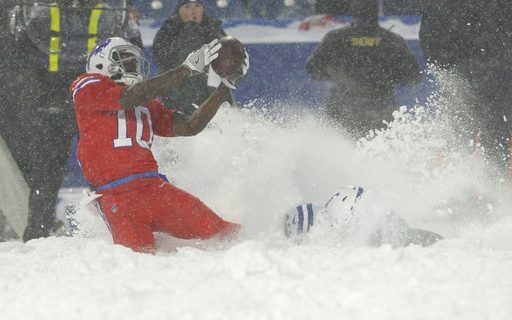 I loved the fact that the Bills coaches adapted the game plan to account for the weather. That doesn’t always happen. Coaches who spent a whole week on a gameplan can be stubborn to change. But they changed the kind of routes that were run and the kind of passes that Nathan Peterman threw. As the weather got better, and the players understood what they could do with footing in the snow, they adapted again. This is good coaching. Then, when they started to figure it all out, Peterman goes down and Webb has to come in. Any 3rd string NFL quarterback is usually a huge dropoff. But Webb was solid, except for the interception that almost cost the Bills the game. His throw to Thompson was the play of the game that set up McCoy’s winner. Credit to the Bills coaches for properly preparing Webb to come in and save the day. The defensive coaches also adapted to what the Colts could and couldn’t do. Again, smart on their part. This was a good win under difficult conditions. I won’t focus too much on a bad decision about a punt. I’ll focus on the Bills coaches doing everything they should to get their team an important victory. Thanks Paul! McDermott did what mosrt coaches would do there, and it worked. And the Bills were not got on 4th and 1 in that game. Glad you can move on. There’s a certain negative afternoon drive radio co-host that just won’t let it go!!!!! Easy to get lost in numbers and analytics. Sorry for the misspellings, most and good not mosrt and got !! !